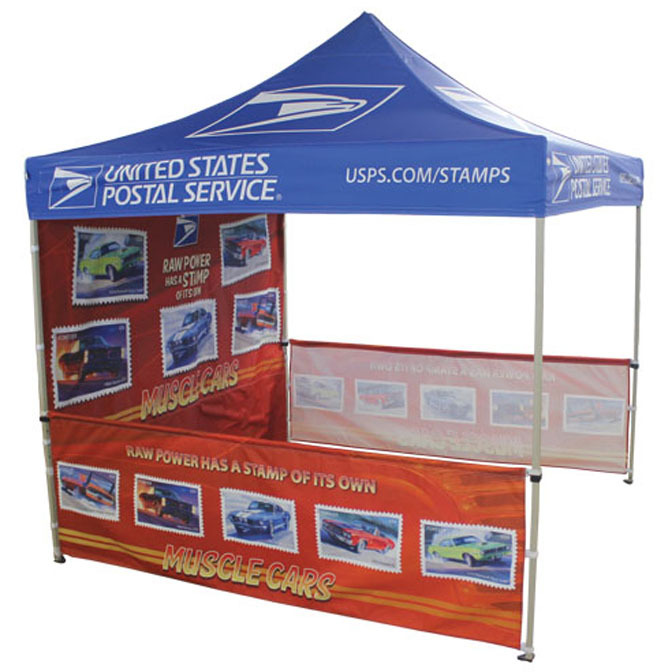 10' x 10' Fast Shade Pop-Up Canopy Top, Full Color. Choice of Aluminum or Steel Folding Frame (Select option above). Commercial Grade Roller Bag with storage pocket. Bag is manufactured with commercial grade 600D polyester fabric. 10' Fast Shade Backdrop. Backdrop attaches to the the inside of the canopy tent top with 1 inch hook and loop. Rail Skirts and hardware needed to attach to Fast Shade folding frame. Product is printed on 500D Polyester fabric with a Polyurethane backing. The material is water-resistant. Inks used in Celina's manufacturing processes are made with commercial grade pigments designed to resist color fading for 2 years. Colorfastness will vary depending on the product's exposure to direct sunlight. Flame Resistant, meets or exceed NFPA-701 and/or CPAI-84. Flame certificate will be sewn inside valance of the canopy tent top. Receive a Free Digital Proof on all orders.